I am looking to get a full size 9 mm. This will be for target and casual competitions. Would like something with a threaded 5 inch barrel, maybe glock or sig. Whats your ideas in these categories. I would like to be at the 500 to 700 price range, hopefully the lower end. Honestly. Do not dismiss the new S&W M&P 2.0. I have shot the crap out of friends of mine who've got both full size, and compact. Once more? The interchange. Shot a full size slide on the compact frame, and that was awesome! My CZ P09 9MM is the most accurate semi-auto pistol I've ever fired. While mine is a standard P09 you can get the P09's with threaded barrel and the taller sights to sight it over top of a suppressor. That's the Urban Gray model. These are P01's, not P09's but the picture gives you an idea of the differences between a standard model and an Urban Gray model. The only drawback I see to the P09's are the magazine cost. About like H&K's and some other high end pistols. The P09 is a polymer framed pistol. Recoil is very light. Stanard magazine capacity if 19 and some pistols (like the Urban Gray model) come with two magazines with +2 base plates on them that increases the capacity to 21 rounds in the magazine. I had my slide machined for an RMR and taller back up sights. This is one of my sighting in day targets. The group that is just high and right was three shots at 7 yds. I made an adjustment to the RMR and shot at the target company logo in the bottom right corner of the target (again at 7 yds.). That group was 7 shots. All that was factory Federal 115 grain FMJ ammo. Good luck with whichever pistol you buy. Thanks guys, I like that set up with optic. The prices I found look right too. Love my P89. I realize this model isn't made anymore but, I like Ruger. I've sent thousands of rounds down range problem free. Never had a jam, & have used many different mfgs of ammo over the years. Bought new in spring 1994. Few could look at it, & realize how old it is. Probably the best $400 I ever spent on a handgun. Several months ago I got to shoot a friends CZ 75B Omega. I have to say it is the most comfortable , best fit in the hand non 1911 Pistol I have ever shot. It has a threaded barrel and a 17 rd. mag. I think he paid around $625....Worth every penny. The RMR was a hard thing for me to do. It cost more than the pistol and the machine work on the slide added to the expense. It was worth it. I had the P09 done first and headed to the range with it when I got the slide back. The next week I sent my P07 out for the same work. The P07 is my EDC pistol. That RMR doesn't use batteries. It's fiber optic lit when there is enough light and tritium illuminated when there is little to no light. That is a really nice grouping you have there. After looking into the costs to put a optic on, I am leaning towards a Glock 34. 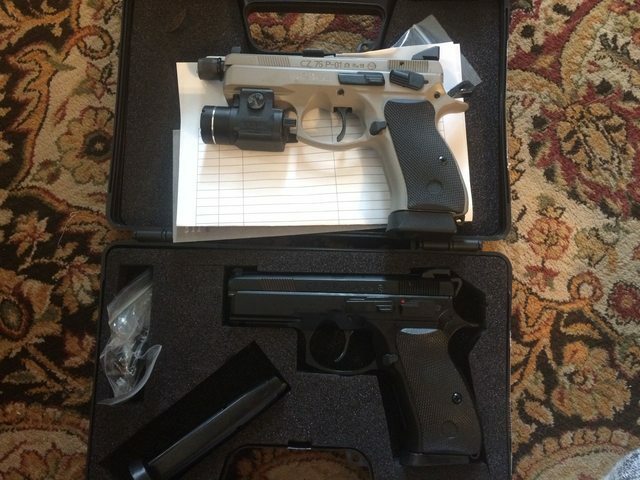 Still looking at the CZ options too. G34 is what i bought for the same reason as you are looking. I did not buy (don't think they had released it yet) the factory RMR cut slide. Wish i had. I like the pistol, but i am a Glock fan boy. I ended up putting a Zev trigger and mag well flare on it. I also changed the factory sites for big dot tritium sights to match all my other Glock sights. I went with the Glock 34, gen 5. So far pretty happy with it. Went through 100 rounds with no problems. I might look into a new trigger, but definitely a reflex sight. Want to try to keep it under 200, any ideas? Vortex has a new Crossfire reflex sight that's pretty nice.